Steam them for about 5 min or until soft. Don't overcook. Place them in an ice bath to cool. This will help keep the consistency and color. Wrap up your favorire ingredients! You can use chicken, turkey, salmon, eggs. Brown ground beef in a skillet on med-high heat. Transfer to bowl. Chop green onions and top ground beef. Warm up veggies. Cut lettuce cups. Assemble lettuce cups with veggies, beef and top with coconut aminos. Enjoy! (*MP) Meal Prep - This ingredient is included and prepared ahead of time in Barefood Nutrition's Meal Prep Guide. Download here. Season salmon with salt + pepper, heat on med-high heat in small skillet until cooked through and flakey (About 5-7 Min). Let cool. Shred salmon with a fork. Discard the skin (if salmon has skin). Assemble tacos. Top with arugula, onion, avocado and fresh lime juice. Add hot sauce if desired. Enjoy! Prep your cauliflower. Remove outside leaves and trim off the stem. Quarter the cauliflower and roughly chop all four sections.Heat oil in a large pot over medium/high heat. Add onion and sauté for 5 minutes until soft and translucent, then stir in the garlic until fragrant. Add chopped cauliflower, vegetable stock and thyme and stir. Cook the mixture until it reaches a simmer, then reduce heat, cover with a lid and let simmer for about 20-25 minutes or until you can pierce through the cauliflower with a fork. Remove the thyme sprigs. Next, transfer the soup into a blender or food processor and blend until smooth. Pour soup back into your pot and add in the coconut milk and parmesan cheese. Top with salt and pepper and whatever other garnishes you'd like. Enjoy! This is a great base for fish/beef dishes and will keep in the refrigerator for 3-4 days. Heat olive oil over medium heat in a large pot. Add shallots and cook for about 3-4 minutes until fragrant and translucent (add a pinch of salt). Add chopped kale and crushed red pepper and stir for another 2-3 minutes until kale is slightly wilted. Add the lentils to the pot along with the chicken broth and water. Turn heat to medium-high and bring to a boil. Cook for 30 minutes, or until lentils are tender. Turn heat to low. Squeeze the juice of two small lemons into the pot and stir. I recommend doing one lemon, tasting and adding the other if desired. Serve in bowls with a slice of lemon and enjoy! Keeps well in the fridge for 2-3 days. Place spinach and arugula in large serving bowl. Chop up all fruit and veggies. Add to serving bowl. Season salmon with kosher salt. Mix sesame seeds and chia seeds in small bowl. Dip and press one side of salmon filet into seed mixture to fully coat top of salmon. Heat olive oil on med/high heat in a large skillet. Cook salmon filets seed side down for 2-3 minutes. Flip filet and cook skin side down for an additional 2 minutes. Remove from pan and set aside. Pour all vinaigrette ingredients into a blender and blend on high until smooth. Transfer to a mason jar for future use. Top salad with salmon and add vinaigrette over top as needed. Optional: I added a dash of garlic powder and red chili pepper flakes for some extra spice. Enjoy! In a small bowl combine tuna, greek yogurt, diced tomatoes and cucumbers, feta cheese, salt and pepper. Cut an avocado in half, remove the pit, stuff tuna mixture in avocado and top with paprika. Enjoy! Cook raw shrimp in large skillet with 1 tbsp of olive oil or coconut oil. Remove from pan when pink. Set aside and let cool. Boil water and cook asian noodles until al dente. Chop remaining ingredients. Pull mint leaves off stems. Take a large skillet and fill up with about an inch of warm water. Set one rice paper in the water and massage for about 15 seconds until it becomes gummy and flexible. Remove wrapper from the water and set it on a flat surface like a cutting board, but first dampen the board with some water. Next, fill the wrap up with a little bit of every ingredient. Roll like a burrito and set aside. Make as many as you'd like and enjoy! These are delicious dipped in peanut sauce. Boil chicken breast in water for about 15 minutes. When chicken is tender and falling apart, drain water, and let chicken cool. Dice chicken and put into small bowl. Add Olive Oil Organic Mayo, garlic powder, paprika, salt and pepper. Mix together - add more mayo to reach desired creaminess. Put chicken salad in spinach wrap, add sliced cucumber, raw spinach and any other veggies you'd like. The more the merrier! Wrap it up and cut in half. Serve on a bed of mixed greens tossed in olive oil, lemon juice and pepper. Enjoy! Cook the rice per directions on package. While rice is cooking, soft boil the egg by bringing an egg in a small sauce pan to a boil. Once the water reaches a rapid boil, remove from heat, cover and let sit for 4 minutes. Immediately transfer egg with a slotted spoon to an ice bath. Peel. Set aside. Slice your avocado. Heat 1 tbsp of olive oil on medium heat in a small frying pan. Season your thawed (not frozen) salmon filet with salt and pepper. When the oil is hot, throw on your salmon fillet. Cook for 7-9 minutes depending on how well done you like your salmon. I check it at 7 and make sure it is flaky. While the salmon is cooking, build your bowl. Rice on the bottom, add your salmon filet straight from the pan, your soft boiled egg, avocado and drizzle bowl with Anti-inflammatory dressing if desired. See dressing recipe here. Enjoy! Preheat oven to 450 degrees. Line a baking sheet with foil. Peel your beet and roast it for about 45 minutes or until you can stick a fork through its center. Remove from the oven and let cool for about 5-10 minutes. Next, combine all ingredients in a food processor or blender. Slowly drizzle in olive oil as you're blending. Serve chilled with pita and an extra drizzle of olive oil on top. Enjoy! Cook barley according to package instructions. Set aside to cool. Whisk together the vinaigrette ingredients and toss with the kale. Toss very well to get all kale coated. Once barley is cool, toss with the kale vinaigrette and remaining ingredients. Leave avocado out until right before serving or eating. Enjoy! Dressing: Place the cashews and chia seeds in a small food processor or ninja. Grind them into a powder. Put the cashew / chia mix in your blender with the remaining ingredients. Blend until smooth and creamy. Chicken/Salad: Season your raw chicken breast with salt and pepper on both sides. Heat a small frying pan to medium-high heat. Add olive oil. Grill chicken breast on each side for about 5-7 minutes until golden and slightly crispy. Remove chicken from heat and place on cutting board. Slice chicken immediately. Prepare salad with whatever veggies you'd like, top with chicken pieces and creamy dressing. Separate ingredients into divided mason jar and pack for your lunch. Enjoy! 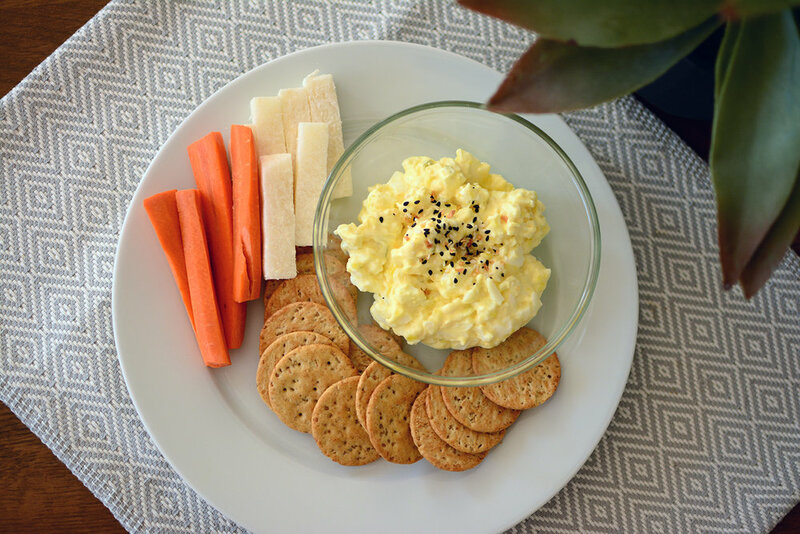 Veggies + Gluten free crackers for dipping. Mash up hard boiled eggs in a bowl, add all other ingredients and mix until desired consistency. Chop up some veggies, dip and enjoy. In a small bowl, whisk together olive oil, lemon juice, salt, and pepper. Set aside. In a large bowl mix togethercannelloni beans, drained tuna, parsley, arugula and onions. 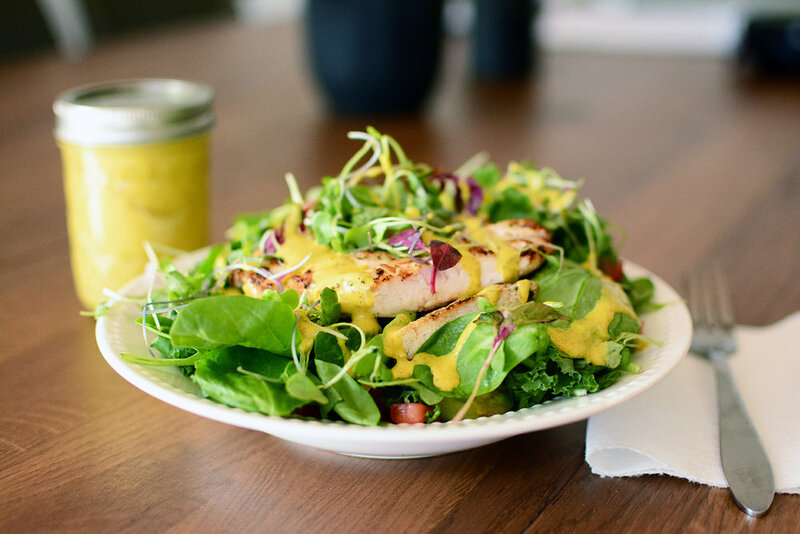 Drizzle salad dressing over salad and enjoy!